Join in the competitive fun and register in a TEAM. A plaque will be presented to the winning gym/personal trainer, corporate and runners teams. Special Buses to Sutherland will leave from Cronulla High School. The first bus will depart at 6.30am and the last bus at 7.15am. Buses will also be available for return to Sutherland after race presentation. The first bus will leave at approximately 9:30 and the last bus leaves Cronulla High School at 11.00am. Cost is $5.00 per person each way. CASH ONLY. No opal cards. Can I run/walk with a pram? Yes you can walk with a baby and pram, we just ask that you start at the very back. We need the prams behind the runners at the start line for safety reasons. Your net start time will not start till you cross the first timing pad at the start line. You will also need to register your child as Under 5 for insurance purposes. Your child will also receive a race bib which you can pin onto the pram. Clothing transport All care and no responsibility will be taken in the baggage area, we advise entrants not to leave valuables including wallets, phones and keys. Start Area – behind Sutherland Entertainment Area. Note: Clothing truck leaves at 7.45am to transport to Finish. – You will be given a small bag at the baggage area. – Tear the clothing tag from your race number and fix around the bag provided. – Individual items only may be placed within the bag eg t-shirts, jumpers, gloves. – No personal bags of any description (backpacks, purses, handbags) will be accepted. – Show your bib when leaving your bag with the baggage volunteers. – After your run you will be asked again to show your bib to collect your bag. Please note: To avoid delays, please do not bring backpacks or large bags to the event. This year, NSW Police may conduct searches of bags and items left in the Clothing/Bag Drop area. Apologies for the inconvenience. Do you hand out medals? Yes. Everyone who crosses the finish line will collect a Commemorative PAYCE Sutherland 2 Surf medal! Finishers’ certificates can be downloaded from the results section of this website. Finishing results will be posted on the race website and major places will also be published in the St George and Sutherland Shire Leader. Showers and changing facilities are available for both genders in the Club House. There are portaloos at the Start and Finish. There are no toilets provided along the course. Stay Hydrated. There are water stations along the course. At the Finish area, there is a water station where you can grab a cup of water or you can top up your water bottles at the water refill units courtesy of Enware. How do I wear the Race Bib Tag? Click here to watch the instructional video on how to wear your Race Bib Tag. I have a team running, where can I put up a Tent at the Finish? If you come down to Don Lucas Reserve on the Saturday before Race day from 3:00pm-4:00pm the PAYCE Sutherland 2 Surf Organisers can show you the designated zone where you can mark out an area to lay your tent. It is recommended to put the tent up the next morning on Race day before 7:30am. There is security overnight. Your tent is your responsibility and Wanda SLSC does not reserve places, it is first in first serve. However, if you wish to be in the official area as a sponsor please contact clubhouse@wandaslsc.com.au. Sponsorships have now closed for the 2018 PAYCE Sutherland 2 Surf. Runners Team Challenge sponsored by Veolia – for all others who want to run as a team. The Event App will not be available for 2019. While it was a helpful resource and communication device it is really tailored for Marathons. There were some instances where pinpointing the location of runners was not quite accurate. Wanda SLSC would like to thank PAYCE, Fitness First and Dynamic Performance Physiotherapy for making it possible to have the App. For your safety, all race rules are enforceable. Non-compliance will result in instant disqualification. You must wear your own allocated chest bib tag; they are not transferable. Please be careful if running with others that you do not mix up your bib tag or lose or forget your bib tag on race morning there will be a limited amount of replacements at the late entries area on the day at the Entertainment Centre for a fee of $20.00. There will be a “mat” timing both the start and finish, allowing for you to have an accurate net time. However as in accordance with IAAF rules all prizes will be based on the “gun” time. Remember, you will be receiving a net time and therefore, we would ask you to be patient, as it may take a minute for you to cross the start line. At the finish line you must cross the timing mats to ensure a time. Past the finish line – keep moving into the recovery area. The organiser reserves the right to reject or cancel any entry in the race at any time. Police requirements are that competitors stay in the left nearside lane along the route, and walkers are not to impede runners if overtaking. Traffic signals and directions must be obeyed unless otherwise directed by Police or Race Officials. No bikes, roller skates, scooters, skateboards or dogs allowed. Due to a Police requirement, all runners as they come out of Hotham Parade to turn into the Kingsway (at Gymea Tech) must immediately go to the left hand side of the Kingsway and keep on the left hand side all the way to the Cronulla Hotel. Please consider the environment and use bins to dispose of any litter. To plan your trip on public transport, check the PAYCE Sutherland 2 Surf fun run and walk event page on transportnsw.info. For a full list of road closures, check Live Traffic. 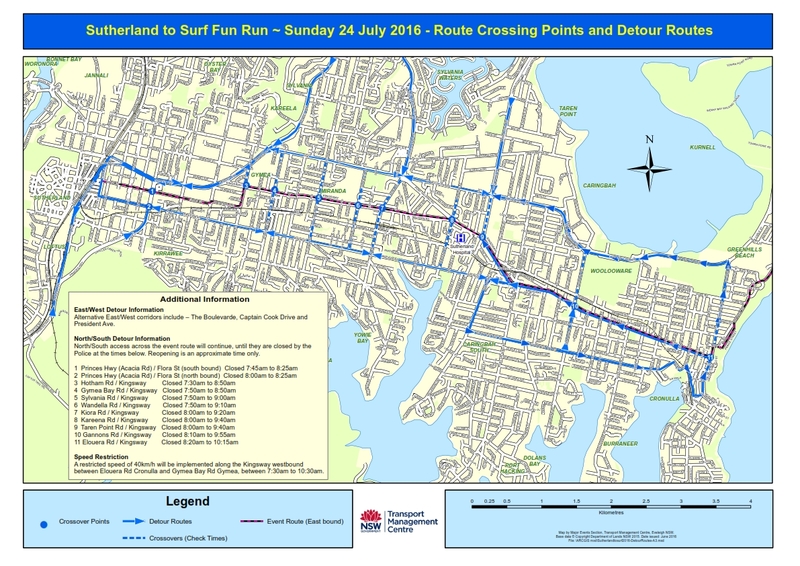 Road closures will be in place in the Sutherland Shire on Sunday 21st July 2019, for the PAYCE Sutherland 2 Surf Fun Run and Walk. Roads in the Sutherland Shire and Cronulla will begin closing from 5.30am on Sunday 21st July 2019, with a progressive reopening of roads from 8:20am with all roads open by 10:30am. Route crossing points and detour routes can be found here. The event will start at 8:00am on Flora St, Sutherland, continuing onto Clements Pde, left to Hotham Rd and right onto the Kingsway to use east bound lanes only of the Kingsway to finish at Don Lucas Reserve Cronulla. Patrons attending the PAYCE Sutherland 2 Surf Fun Run and Walk are advised to use public transport. Police may restrict vehicle access along closed roads, including residents and businesses. Roads will be progressively reopened by Roads & Maritime Services and Police after cleaning. Greenhills car park – from the corner of Mitchell Road the finish line is located within the Greenhills Car Park. During the eastbound closure of The Kingsway, motorists travelling north of The Kingsway should use The Boulevarde and Captain Cook Drive. Motorists travelling south of The Kingsway should use President Avenue. Elouera Rd will be closed from 8.20am to 10.15am and there will be no vehicle access North and South Cronulla. A restricted speed of 40km/hr will be implemented along the Kingsway westbound Elouera Rd and Hotham Rd 7:30am to 10:30am. Special Buses to Sutherland will leave from Cronulla High School. First bus will depart at 6.30am and the last bus at 7.15am. Buses will also be available for return to Sutherland after race presentation. The last bus leaves Cronulla High School at 11.00am. Cost is $5.00 per person each way. No opal cards. Brought to you by Dynamic Performance Physiotherapy and The Athlete’s Foot Australia (Miranda), sponsors of the PAYCE Sutherland 2 Surf. You’re invited to join the RUN CLUB in preparation for the PAYCE Sutherland 2 Surf. WHAT: 10 week training program with weekly meet-ups, local Sutherland Shire run and ongoing support. Exclusive in store events including advice from a physiotherapist and dietitian from DPP & SM. All ages and abilities welcome (and encouraged!). For more information, contact Jazmine on jthomas@taf.com.au or ask the team in store! Disclaimer: This program is being provided exclusively by The Athlete’s Foot and Dynamic Performance Physiotherapy. Wanda Surf Life Saving Club Inc is in no way responsible for this program. All enquiries should be directed to The Athlete’s Foot. Please assemble on start line at Flora Street, Sutherland by 7.45am and ensure your Bib Tag is attached on the front of your shirt prior to entering the starting compound. Click here to find out how to wear your bib tag. IMPORTANT: Attention Walkers, for the safety of everyone, you must start at the rear of the runners behind the NOVA 96.9 arch. Race officials will be on hand to ensure correct start positions for all seeded, general runners and walkers. Please position yourself in the start line based on your ability. If this is your first time in the race, it would be wise to stick to the side and towards the back of the line. The start is very congested, so please keep a close eye on the competitors in front of you. If the pace is too fast, slowly make your way to the side of the road. Special Buses to Sutherland will leave from Cronulla High School. First bus will depart at 6.30am and the last bus at 7.15am. Buses will also be available for return to Sutherland after race presentation. The first bus will leave at approximately 9:30 and the last bus leaves Cronulla High School at 11.00am. Cost is $5.00 per person each way. CASH ONLY. No opal cards. Presentation will commence at approximately 10:00am. Which Team Type should I select?